Roaming Stamper: Isn't this BEAUTIFUL! The picture just doesn't do this card justice. I got this in a swap I participated in and it just jumped out at me the minute I saw it. It is a WOW card all the way. 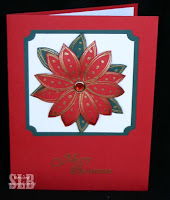 This card was made by Donna Worrell a Stampin' Up Demonstrator in Wilmington, North Carolina. I'm so blessed to be a part of this great group of ladies and to be able to swap with them every month. Thank you Donna for your wonderful creation! This really is a beautiful card. Thanks for sharing!